R5H is end of life (EOL). MikroTik recommends R52HnD for functional replacement. MikroTik introduces the R5H wireless 802.11a miniPCI card for high speed applications with up to 320mW output power. It works in the 4.920-6.100GHz frequency range and supports Turbo mode for faster transfers. 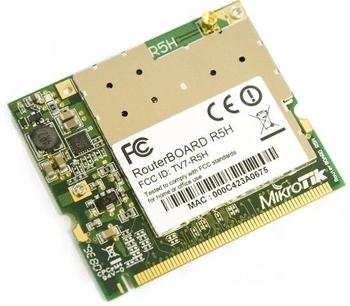 The card performs best when used with MikroTik RouterOS. The R5H is optimized to work with the MikroTik Nstreme protocol to reach extra long distances at a great speed. Nstreme is MikroTik's proprietary wireless protocol created to overcome speed and distance limitations of IEEE 802.11 standards and to extend point-to-point and point-to-multipoint wireless link performance. Nstreme-dual protocol is designed to provide real full-duplex communications over wireless with a pair of wireless cards--one for transmitting data and one for receiving.